Join us for the next part of Devoran 100, remembering the local men who served during World War 1 one hundred years ago, as World War 1 came to an end. I will be updating the display from 2014 about each casualty with what we have unearthed or researched about them since then. Every Remembrance Sunday the local casualty names are read out at the War Memorial. How else has Devoran marked the contribution of the area in World War 1 during the 1914-1919 Centenary? In 2014 the fabulous Devoran Village Hall team organised the Poppies coffee morning to mark the outbreak of WW1 100 years on. Shortly after this the Devoran Parish Roll of Honour left for restoration, thanks to a Heritage Lottery Fund Grant. Rev. Margaret Saville unveiling the Handmade poppies framing the WW1 roll of Honour, Devoran Village Hall, 19 July 2014. In 2014 two new WW1 names – P. Sweet and W.J. Hoyle – were added to the Devoran War Memorial after research by Bob Richards. A few of the items on display in 2014. At the Devoran Centenary Railway Festival in 2015, the WW1 Roll of Honour returned, looking as good as new, with the exciting discovery of a lost early draft section hidden behind the familiar frontispiece. On 1st July 2016 Bob Richards, Ann Cunningham and I told some of the stories behind the 1914 – 1916 casualties and the “Names on The Roll”. In 2018, on the 100th anniversary of the Armistice, the Devoran Village Hall is hosting a tea and coffee event with the chance to view an update of the Devoran War Memorial Project display from 2014 and 2016. Bob, Ann and I hope in autumn 2019 – after five years of researching the names on the Roll and the War Memorial – to do the final talk about Devoran men of WW1 and their families. This will update the story from 1916 to 1919, and be scheduled for round about the time that the War Memorial recreation ground was dedicated and the War Memorial built in Devoran. Dates tbc. On the 100th anniversary date of each identified casualty on the WW1 Devoran War Memorial, I have posted an update on this blog of what we know about that man and his death in WW1. We marked or will mark the 70th, 75th and 80th anniversary of the WW2 names from Devoran as well. We may do a future talk on the thankfully fewer WW2 names after 2019. Sadly these posts do not come to an end with the Armistice Centenary but extend out into 1919/2019 as the final casulaties died of wounds many months after the Armistice. The mental and physical scars were born by the surviving men and the families of Devoran for many years afterwards. 100 years on, Devoran remembers. Blogposted by Mark Norris, Devoran War Memorial Project, September 2018. This entry was posted in Cornwall, Devoran, Remembrance Sunday, war memorial, WW1, WW2 and tagged Devoran Village Hall, WW1 Centenary, WW100 on October 5, 2018 by worldwarzoogardener1939. 9th July 1917 – a young woman from Devoran finishes her service as an ambulance driver in France during the First World War and heads home to her village with a happy heart. She must have seen some terrible sights during her nine months service overseas, seeing some of the human wreckage of the trenches. The Doctor’s daughter must have been relieved to see her home safely again. On Devoran Lane, not far from St. John and St Petroc’s Church and Vicarage, is the Driffold, once a hotel, now known as Edwards Road. The Driffold in Late Victorian times and into the Edwardian / First World War period was home to Doctor Philip Hugh Edwards family. It is still known as Edwards House, opposite the modern 1980s houses of Edwards Road. An enquiry lodged with the BRCS archives for any further information on Gwendoline Mary Edwards elicited that VAD Cornwall 34 (34 might be her number or an area number) Gwendoline Edwards served as a 21 year old from 13 October 1916 as Rank G.S. (General Service?) Chauffeuse until 9 July 1917 (a week before her wedding). Particulars of duties: Motor Ambulance Driving in France. VAD Cornwall 34 might be her number or an area number. The reason for her happy return before the end of the war? 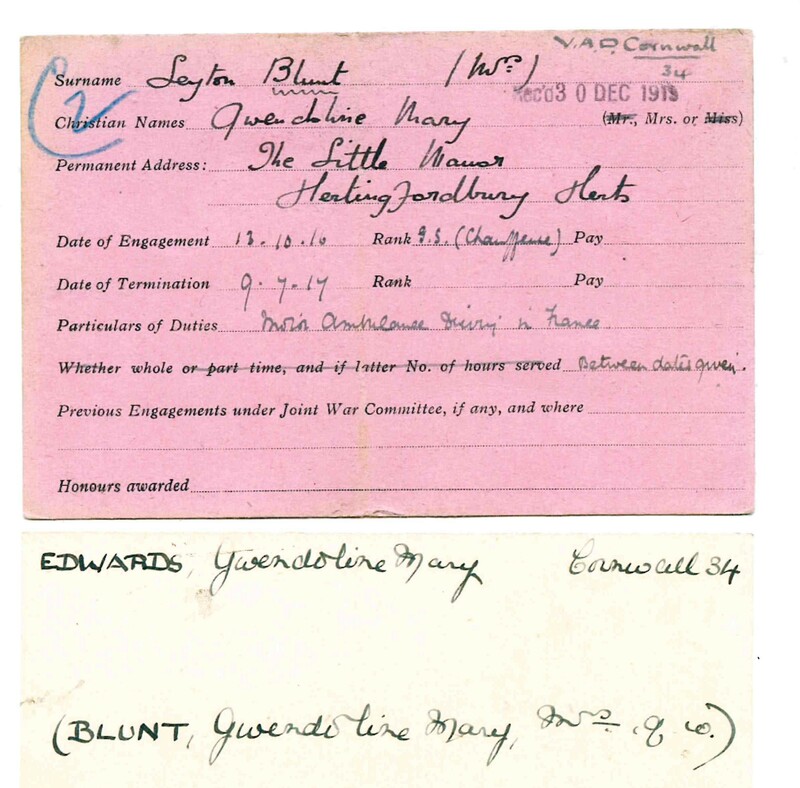 A week later 100 years ago on the 16th July 1917 Gwendoline was married and became Mrs Gwendoline Layton Blunt. Although we have failed to find a photo of the wedding or of Gwendoline so far, we have found a duplicate of the certificate. We will publish more about the wedding including press cuttings found by my fellow researcher Bob Richards. This entry was posted in Cornwall, Devoran, war memorial, WW1, WW2 and tagged 1917, BRCS, British Red Cross Archive, Devoran WW1, Driffold, Gwendoline Layton Blunt, Gwendoline Mary Edwards, WW1 Centenary, WW1 nursing, WW100 on July 9, 2017 by worldwarzoogardener1939. In 2014 Rifleman Percy Sweet’s name was included on the additional panel to the Devoran Parish War Memorial, despite not appearing on the original Roll of Honour. The new panel on the Devoran War Memorial, listing two new WW1 Devoran casualty names P.A. Sweet and W.J. Hoyle, thanks to work / research by Bob Richards and the Feock Parish Council. Devoran resident Rifleman Percy Archibald Sweet 474189 of the 12th London Regiment (The Rangers) was killed aged 31 on 9 April 1917 during the battle (7-9 April) to take the French village of Neuville Vitasse by the 56th (London) Division. He is buried at plot 1 A 35 with many other London Rangers in the London Cemetery, Neuville Vitasse. One famous casualty of the Battle of Arras, fought at Easter, was the talented Country writer and poet Edward Thomas. He was killed by shellfire at Easter during the first day of the Battle of Arras two years later. A fitting tribute to one such of the men who was a resident of Devoran and London, Percy Sweet. Percy Sweet’s father Francis and Louisa Sweet lived at Fernmere on Market Street in Devoran. Percy is also listed on the CWGC website as a ‘native of Hammersmith’ London where Percy and his brothers and sisters were born. His father (a shoemaker) and mother are still listed in the 1911 census working in London but by the time Rifleman Percy Sweet was killed in France in 1917, the family were living in Devoran. His father Francis Sweet was born in Kenwyn, Truro and his mother Louisa (nee Pridham) from Southdown in Cornwall. Percy Sweet was born in Hammersmith, 1887 and was listed in the 1911 census as a Cordwainer (a leather worker / shoemaker) in London. This explains why he enlisted in a London regiment. Percy Sweet’s Service Records survive and give a few personal details of his enlistment (attestation) including being issued with spectacles whilst out in France on army service. Neuville-Vitasse was attacked by the 56th (London) Division on 7 April 1917 and captured by the same Division on 9 April. The village was almost entirely lost at the end of March 1918 but regained at the end of the following August. It was later “adopted” by the Metropolitan Borough of Paddington. The London Cemetery was made by the 56th London Division in April 1917 and greatly extended after the Armistice when graves were brought in from other burial grounds and from the battlefields between Arras, Vis-en-Artois and Croisilles. Neuville-Vitasse is a village in the department of the Pas-de-Calais, 5 kilometres south-east of Arras on the D5. London Cemetery stands on the west side of the road to Arras in a shallow valley. London Cemetery contains 747 burials and commemorations of the First World War, amongst them Rifleman Percy Sweet, one time resident of Devoran. 318 of the burials are unidentified. The cemetery was designed by famous architect Sir Edwin Lutyens. Remembering Percy Sweet of Devoran and London, his Comrades of the London Regiment and all those of all nations who fell at the Battle of Arras 1917, remembered in Devoran, 100 years later. This entry was posted in Cornwall, Devoran, Uncategorized, war memorial, WW1 and tagged 1917, Arras100, Battle Of Arras, CWGC, Edward Thomas, London Regiment, Percy Sweet, Poetry, WW1 Centenary, WW1 Poetry, WW100 on April 9, 2017 by worldwarzoogardener1939.